Plant features: saffron is a plant with an height of 20-30 cm, composed of a 5 cm large bulbs containing 20 gems, of which only 3 will grow into tre sprouts, which will give birth to leaves and flowers. The flower is made of 6 violet coloured heart-shaped petals. From the deepest part of the bulb overlooks a yellow thread, which sticks out from the flower base and is divided into tree orange coloured threads. Most commonly used parts: flower thread’s filaments with a length comprised between 2,5 and 4 cm. 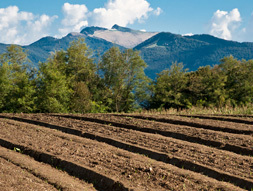 Periodicity: the harvest occurs between the end of September and November. 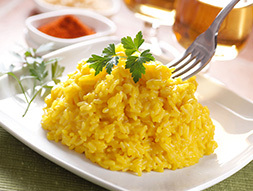 Features: its typical colour is due to the carotenoid pigments, as crocina; the most important feature of essential oil ist he safranale, which gives saffron ist unique aroma. 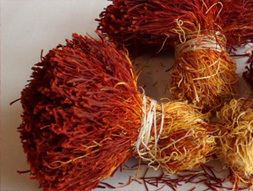 Saffron types commonly sold: filaments, powder. Appearance: threads or powder yellow-organge coloured, drifting to dark red. Smell: typical iodine perfume, with hay scents. Taste: bitter-aromatic, intense, can remind mushrooms and honey smell. 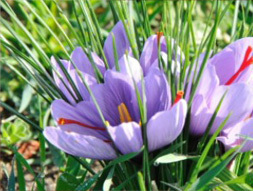 Saffron is usually planted in Spring and its flower blossoms in October with Autumn blooming. The flower has a colour ranging from light lilly to dark violet and ist corolla hosts tree dark red, lively coloured filaments, which give the precious spice. 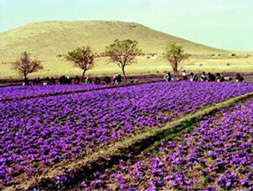 Persia and India rank among the most famous countries for saffron production, but also Spain, Greece, and also Italy, with Abruzzo and Sardinia coltivation, overlook among the best ones. Top quality saffron never match with low price. When the spice is too affordable, it is very likely to hide unpleasant surprises. Once you’ll have opened the sachet, you’ll probably find out that you have bought a poor quality saffron, or that its weight is inferior to the one of concurrent alike products. Moreover, the powder should have a uniform look, without white or red coloured spots. If this is the case, it means that the product is low end or that it has been mixed with other elements with no culinary value. Saffron is a natural product, cultivated with no fertiliser, neither chemical additives or pesticide: as a matter of fact, saffron productive chain is manually performed and that’s why it’s so precious. Its flowers are collected one by one and then the threads inside the corolla are taken out and dried to get rid of umidity. Umidity risks altering saffron quality and its weight, causing the development of micro-organism and harmful mildews. Saffron is the killer ingredient of several receipts: it enhances the flavour of each dish, from starters to dessert, awarding taste and perfume to each course with no added fats. Well known and appreciated since ancient times, this spice has been used and beloved for its properties in each historical era. Egyptians used it to colour fabrics, unguents and perfumes, but also as flavour to enrich food taste. Cleopatra used it to give a glimse of gold to her skin. 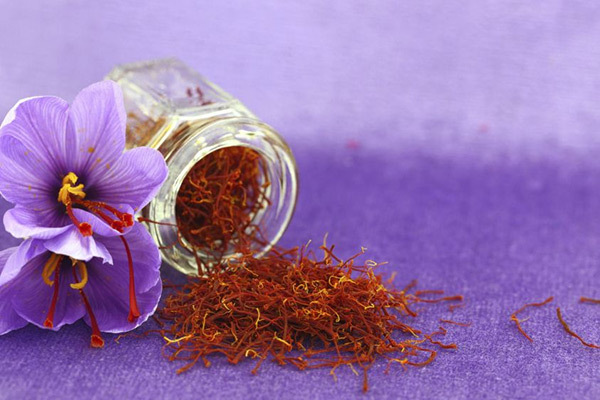 And more: saffron has been frequently used also in art and portrayed in paintings, prints and frescos. The first ones dates back to 1.600 a.c. and are the Cnosso frescos, in the Crete Island, featuring young girls while collecting saffron flowers. Mentioned by the poet Omero in one of its master pieces, the worldfamous “Illiade”, saffron did boast a great popularity in Greek culture: Greece believe that its flowers had been used to create the bed of Zeus, the king of Olympus. A the time of maritime Republics, many shipments to Eastern countries had been specifically organised to secure saffron supply. The spice gave birth to such a thriving traffic, that a dedicated department was established to manage saffron trade. Saffron was probably introduced in Europe from the Moor, who contributed to the spread of the cultivation in North Africa and Spain during the 10th century. In Italy, saffron became a commonly used spice around 1.300, thanks to Domenico Santucci, a Dominican friar belonging to the inquisition party, who imported it from the Iberica Peninsula and then started its cultivation and production in Navelli, his native town in Abruzzo.